Content - ADJ PAR Z120 RGBW & PAR ZP120 RGBW: Classic Par Can On the Outside, COB LED Technology On the Inside! ADJ PAR Z120 RGBW & PAR ZP120 RGBW: Classic Par Can On the Outside, COB LED Technology On the Inside! Halogen par cans have been a staple of theatre, concert and nightclub lighting rigs for decades. With their distinctive shape and convenient variable-angle hanging brackets, they have long been an essential tool for lighting designers working in all sizes of venue. More recently, however, advances in LED technology have meant that traditional halogen-based fixtures are generally making way for more efficient LED-powered units. Despite this, there are many situations where you may still want the look of an authentic par can while also benefiting from the advantages of an LED light source. For this reason, we have developed the PAR Z Series of LED-powered fixtures which are powered by modern LED technology housed in classic par can casings. The series launched last year with white light models and now, due to the popularity of the original fixtures, we are extending the range to include the new PAR Z120 RGBW and PAR ZP120 RGBW fixtures that feature 4-in-1 color mixing LEDs. LED light sources offer a variety of advantages over traditional halogen lamps. These include reduced power draw, less excess heat (keeping the temperature down on stage for performers), considerably longer lamp life and increased flexibility. However, there are a number of situations where you might want to utilize these benefits while maintaining the look of the traditional par can. For example, if you are adding new fixtures to an existing rig that already contains a large number of regular par cans, this will allow the new fixtures to blend in aesthetically. Or if you are installing equipment in a ‘70s or ‘80s venue, or spec’ing a tour or theatre production with a retro theme, you may want to achieve an authentic look while benefiting from the technological advantages of LED. The PAR Z120 RGBW utilizes a potent 115W quad color COB (Chip On Board) LED that offers an output comparable to a 1000W halogen sealed beam par and a life expectancy rated at 50,000 hours. It offers full red, green, blue and white color mixing, which allows for a wide color palette as well as true white illumination. The use of a single cutting-edge COB LED source not only allows for impressive output but also exceptional color mixing without the ‘color shadows’ that are present when separate primary LED sources are used. The PAR ZP120 RGBW offers the same powerful light source but housed in a distinctive polished silver par can enclosure. Both models offer five manually-selectable beam angle settings – 7, 11.5, 16, 20.5 or 25-degrees – meaning that they can be used to wash large portions of a stage or illuminate smaller distinct areas, as required. Adding to the flexibly of the fixtures, they are both also fitted with gel frames that can be used to insert a diffusion filter (sold separately) to further expand the beam angle. Four button LED menu interfaces on the rear of each fixture allow easy setup for standalone operation or DMX control. In standalone mode a choice of 64 color macros is provided, alongside the option to manually select a custom RGBW color mix. For DMX control, a choice of 6 different DMX channel modes (4 / 5 / 6 / 7 / 8 / 9) are available, allowing for varying levels of control depending on the application and control system. Power input is provided to both models via a professional-caliber locking powerCON socket, while the inclusion of a corresponding output socket means that the power supply for multiple fixtures can be daisy-chained from a single plug. Meanwhile, professional 5-pin XLR input and output sockets are also provided for the connection of DMX control. Both fixtures offer a robust metal construction, but – at 8.5 lbs. / 3.9kg. – they are also lightweight, which makes them suited to touring and one-off event production as well as permanent installation. The PAR Z120 RGBW has a subtle black metal powder coating, while the PAR ZP120 RGBW has an eye-catching polished-silver finish. 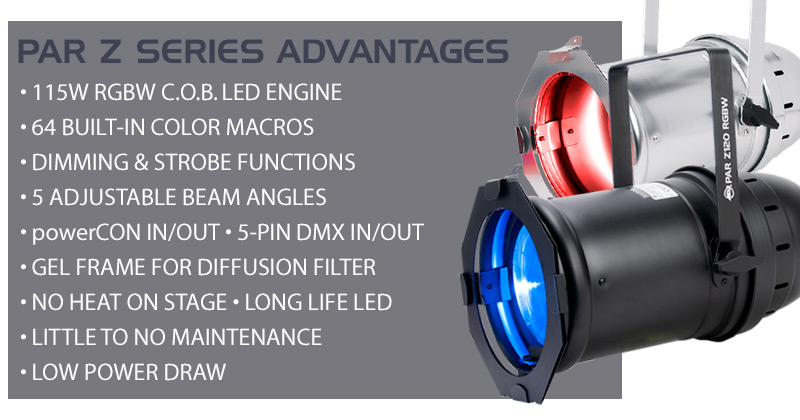 This means that whether you want your fixtures to blend into the background or stand out as a featured part of a stage set or lighting rig, there’s an RGB PAR Z Series fixture to suit your needs. The new PAR Z120 RGBW and PAR ZP120 RGBW join three existing models in the PAR Z Series. The PAR Z100 5K features a 100W white COB LED with a color temperature of 5700K, while the PAR Z100 3K offers a warm white 2700K COB LED light source. Finally, the PAR ZP100 3K offers the same 2700K LED but housed in a polished silver casing. All of the fixtures in the PAR Z Series offer the same authentic par can casing design, which means that the various models can be mixed within a lighting rig while retaining a coherent look. Offering a modern twist on a lighting classic, the PAR Z Series combines the iconic look of the par can with the low power, low heat benefits of LED technology. Building on the success of the original PAR Z fixtures, the new PAR Z120 RGBW and PAR ZP120 RGBW add the flexibility of quad color mixing into the equation to create flexible LED par fixtures capable of generating vibrant washes in a wide variety of colors. If you want the classic look of a par can, the benefits of LED and the versatility of RGBW color mixing, look no further than these powerful and innovative fixtures.